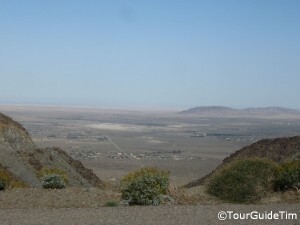 Borrego Springs - TourGuideTim Reveals San Diego! Features: Desert Town Providing Hospitality to Guests of the Anza-Borrego Desert; Includes Resorts, Spas, Stargazing, Adventure Activities, Life-Size Pre-Historic Animals, and Cultural Events. 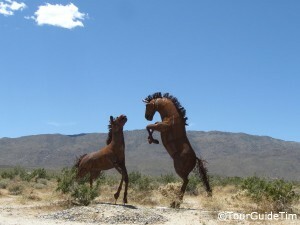 Borrego Springs Highlights: Welcome to a small desert community surrounded by the Anza Borrego Desert State Park, the largest contiguous state park in the country. To the north and west are 6,000+ foot mountains shielding it from San Diego and Los Angeles. To the south and east is nothing but desert for hundreds of miles. This little oasis is where stargazers come from around the world to see the night sky and hard working city dwellers come to get away from it all. Lodging – Visitors can set up a tent for free anywhere in the Anza-Borrego State Park. Those who are looking for basic lodging can find inexpensive motels while those looking for first-class creature comforts can stay at one of resorts with spas and golf. Despite offering the widest range of lodging options you could ask for, there are fewer than a couple dozen hotels and vacation rentals to choose from. It behooves you to make your reservations weeks in advance. Otherwise, bring your tent. 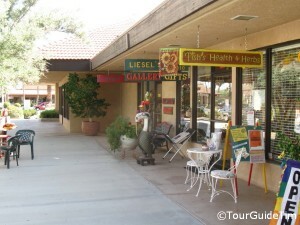 You will see the full list of offerings on the Borrego Springs Chamber of Commerce web site. 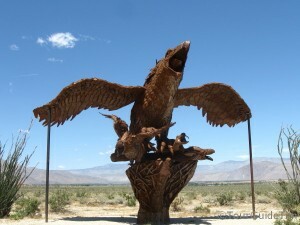 Prehistoric Animals – The Anza-Borrego Desert is regarded as one of the best archaeological sites in North America. San Diego businessman Dennis Avery, heir to the Avery-Dennison office supply empire, is funding the development of life-size art pieces resembling the pre-historic animals that roamed the San Diego desert over a million years ago. Dozen of art pieces are being placed on his property between the Anza-Borrego Desert Visitor Center and the town of Borrego Springs. You will see gomphotheriums (elephants), saber tooth tigers, turtles, llamas, and camels. They are spread along Borrego Springs Road, north of Palm Canyon Drive. It is a popular spot for tourists to stop and take pictures standing beside these huge mammoths that used to roam the Earth. Visit the prehistoric link provided above to see photos and learn more. Watch the four minute video interview of Avery and the artist creating the animal sculptures. 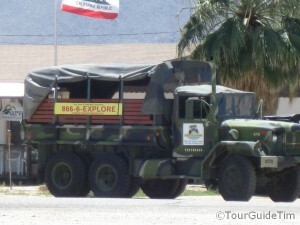 Desert Adventures – Take guided tours of the Desert on Jeeps or Military Transport Vehicles. This is one of the best ways to capture the best views and find the best hiking spots in this vast desert. You will also learn about special events for stargazers and those looking to find ghosts. Borrego Desert Nature Center – Attend Seminars or go on Nature Walks with the Anza-Borrego Desert Natural History Association. The Nature Center is not a museum but it does sell numerous desert related publications and gifts to support its educational programs. Open 9AM – 5PM from September through June. (Fridays and Saturdays only during July and August.) Directions from Google Maps to 652 Palm Canyon Drive. Borrego Art Institute – Visit the latest exhibitions of desert art and check out the works of local desert artists, which you can purchase. Directions from Google Maps to 587 Palm Canyon Drive. 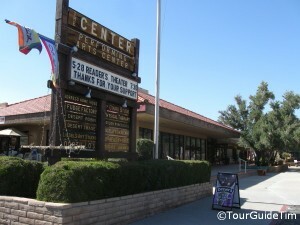 Performing Arts – If you are looking to relax from your day’s adventures in the desert and want to spend a relaxing night in this remote oasis before heading back home, you can find entertainment at the Borrego Springs Performing Arts Center. In addition to the schedule posted at the Borrego Performing Arts Center, take a look at the Borrego Springs Community Concert web site for additional events, which are also held at the Performing Arts Center. Directions from Google Maps to 590 Palm Canyon Drive. 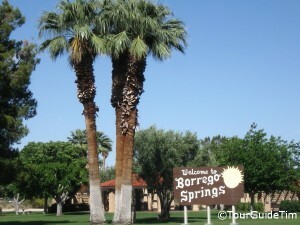 Borrego Springs Chamber of Commerce – To find more information on restaurants, services, shopping, and special events in Borrego Springs, the best source of information is the Chamber of Commerce web site. It lists just about everything that is available. 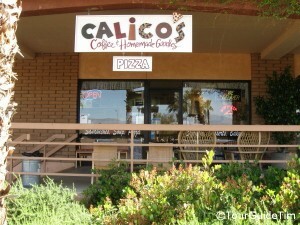 Most visitors from the San Diego area drive through the historic mountain town of Julian and use SR-78 to reach Borrego Springs. If you are driving down from the Los Angeles area, the quickest route takes you on the S-2 to the S-22. If you want to detour to Julian, just drag the blue route marker on the Google Map south to Julian. It will add about an extra half hour of total driving time to reach Borrego Springs. Both of the aforementioned routes into Borrego Springs take you through the San Diego Mountains and provide expansive views of the Desert as you drive down towards Borrego Springs. For those who like the solitude of a long desert drive, you can enter at the south end of the Desert Park on the S-2 from highway I-8. 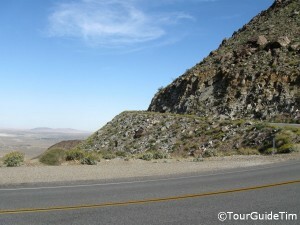 It’s a very quiet 60+ mile drive through the Desert to reach Borrego Springs. However, you will pass by the Carrizo Badlands Overlook where fossils of mammoths over 1 million years old have been found, Agua Caliente Hot Springs County Park, and an original Butterfield Stage Coach Station at the Vallecito County Park. If you take a route through the mountains near Julian, keep an eye out for possible mountain snow in the forecast, when tire chains may be required to get through the mountains. Also note, the State of California places restrictions on RVs over 40′ in length. Transit - There are no transit options that provide regular service into the desert. Related Attractions – Cyclists should check out bike ride events in the San Diego Mountains and Desert. Help others find things to do and see! Share your ideas.